Fritz White was best known throughout the world for his distinctive style of bronze sculpture, and for being a key player in turning Loveland into the well-known sculpture community it is today. He was born January 14, 1930 in Milford, Ohio to Denver and Geneva (Hatfield) White. By the time he was 12, his father had enrolled him in an adult art class in a college in Cincinnati. "The war was going on and those small colleges needed all the students they could get, so they agreed to take me. I got a lot of special attention from the teachers. It was great," he recalled. After graduating from Terrace Park High School in Cincinnati in 1948, Fritz played semi-pro football. Carrying those lessons forward, he later coached junior high football and was fondly known as Coach Whitey. Fritz proudly served in the U.S. Marine Corp. from 1948 to 1953 as Sergeant of a rifle platoon and later as a Gunny. Following his service, Fritz launched Fancy Lettering, a design studio for sales publications, and subsequently took a position with National Underwriter Company. On a whim in 1961, he loaded up his car with large chunks of marble from Marble, Colorado and thus began his long career in sculpture. Thanks to the support of his dear friend John J. McGraw, Fritz was soon working in clay and bronze. A decade later, in the spring of 1972, Fritz was elected to the prestigious Cowboy Artists of America and became widely accepted as one of the finest sculptors of this century. In addition to winning several CAA awards for excellence (including the only sculptor to win the Colt Award), he served as board member, vice president and president. He was also a Fellow of the National Sculpture Society. One of Fritz's largest sculptures, Unconquered, a twice-life sculpture of a rearing horse and rider, was installed at Florida State University in 2003. His sculptures in Loveland include Winning the Iron Shirt at Hwy 287 and N. 19th St., Out of the Mystic Path at Benson Park, Grandmother's Joy at the Visitors Center, Generations at Lake Loveland, and the Paul Rice Memorial at Chase Bank. 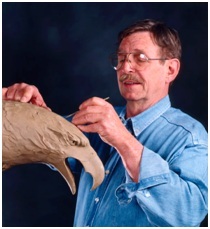 A generous instructor, Fritz often shared his talents with others, teaching numerous sculpture courses. He was especially proud of his one-on-one classes with visually impaired children at Denver's Jewish Community Center and also in Loveland. "It was no different teaching a blind student than a sighted student; they saw through their fingers instead of their eyes," said Fritz. Fritz passed away in April 2010. Up until his last days, White continued his passion for art. While he couldn't make it to a studio, the materials were brought to him, and White would work on the dining room table. "He could work right up until the end," said his wife, Ina. "That's what he wanted." Although White is now gone, Ina hopes his lessons in sculpture and drive for living life to the fullest will inspire other artists in the community for a long time to come.